Our primary focus is placed on energy in United States. We monitor legislation, advocate for energy production and private property rights, as well as educate the public, mineral and royalty owners, and legislators. In the United States, The People are allowed to own their private property minerals and receive royalty from them. The government owns some of the minerals as well. This is good because they either go straight to the government for the public good, or they go to individuals or private owners who pay taxes on the money which then goes to the government, which then goes to public good. The private owners also contribute to job creation that helps our country. The American Royalty Council is an educational non-profit organization. The mission of the organization is: to represent royalty owners and energy professionals dedicated to advancing oil and gas production by creating best business practices through dialogue, communication and education. Private ownership of property/property rights are important. Education and protection through open dialogue with owners, companies, state and federal leaders and lawmakers are keys to maintaining property rights and helps to insure the security of our country and energy independence. Although in the past, only monarchs received “royalties”, today millions of Americans receive royalty payments. Those payments go to owners of minerals, thanks to the founders of this great nation. Each year oil and gas production pays billions of dollars in royalties to both individuals and the government. The monies go to several federal preservation and conservation funds, American Indian tribes, and the states. In most countries, (with the exception of a small number of original land owners in Canada) the government owns all mineral rights. However, in the United States, the land owner owns not only surface land, but what’s underneath, the minerals. In the west, much more federal and state governments held onto land including the minerals below. Offshore mineral rights belong to the states and as you go farther out, the federal government. For more than a century, mineral owners have allowed exploration, development and production of oil and gas because they can share in a percentage of the profits (royalty payments). Individual royalty owners live all over the United States and most inherit royalties. These owners often supplement higher education costs for their family, and/or retirement/SS incomes. Individual royalty owners pay taxes on the income, which helps fund schools and support all functions of government. State and federal royalties go directly to the public. Royalties are spread throughout America, and consequently still go to the “sovereign”: all of us. Encourage, promote and support energy issues on a local, state and national level by educating royalty owners on the grassroots level in all the 435 congressional districts on the importance of the oil and gas industry. Work with the industry, and not against the industry. Provide an objective representative entity for ALL the royalty owners independents, majors, trusts and individuals. Provide an inter-industry royalty council meeting quarterly to discuss the issues and concerns of the industry. ARC could possibly be utilized in the future as a mediation tool; possibly helping to avoid litigation and intra-industry discord. Provide an educational avenue for the oil and gas industry. ARC will provide a quarterly newsletter for companies (at their discretion) to send out with their royalty checks addressing current issues, both regional and national. ARC will provide a comfort level for the vast majority of the nations royalty owners through education, responsible recommendations and actions. National zip code bank to energize at the grassroots royalty owners in all 435 congressional districts in the USA. Coordinate with all participating oil and gas companies by setting up a zip code directory based on their company’s royalty owners. 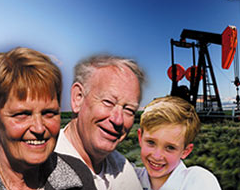 Provide a fair, reasonable and responsible royalty owner voice for the oil and gas industry.